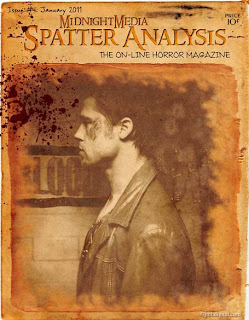 Okay, just wanted to give a quick mention to my good friend Jonny Metro @ "midnitemedia.blogspot.com" who has released his forth installment of "Spatter Analysis" an online horror magazine. Here you are the writers and you get your horror message heard, it is great way to find out more about your fellow blog/websites. Oh yeah it does not hurt that I created the covers... the great collaboration with Jonny, so click on over and read this. Then click and read the previous issues, and tell them that "iZombie" sent you. Thanks for the shout-out, sir! Your support means everything.